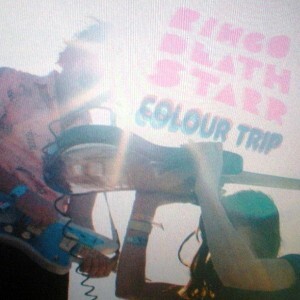 Every review of Ringo Deathstarr's dynamite, long-awaited full-length debut Colour Trip could reasonably begin and end with a discussion of the positively terrific dream-pop gem "Kaleidoscope." The crumbling guitars in the verse, the simple cascading guitar lead in the snare-spangled, heart-rendingly beautiful chorus, the pacing and brevity all make the track among the best released by anyone this year. Fronter and guitarist Elliot Frazier's airy vocals here -- and on another standout track on the new collection, "Day Dreamy" -- recall some of the Austin, Texas-based trio's earliest demos, specifically the paralyzingly great "Your Town" and "Sweet Girl." But mostly it is the elements listed supra that make Ringo Deathstarr one of the most formidable indie rock acts of the new millennium. Listeners will find that the English spelling of the first word of the album title is, of course, no accident. Colour Trip -- thronged with should-be hits, and well worth the long, long wait since the release of the band's debut EP in 2007 -- lovingly borrows from and recreates the sounds of the best late '80s and early '90s UK dreampop and shoegaze. We honestly believe we saw band fronter Elliot Frazier recently and amusingly quip somewhere (it's killing us that we can't find the exact quote again, and Mr. Frazier doesn't recall saying it) in response to a review that his band wasn't re-creating the sounds of 1992, it was pretending 1992 never happened. Or something to the extent. The point is well-taken. What if the ascendancy of RIDE and Slowdive and Chapterhouse and My Bloody Valentine (and to a lesser extent, similarly minded American acts Drop Nineteens and The Swirlies) had gone unchecked? What if American music had not smashed its head on the punk rock and drastically reshaped itself around the sounds of Seattle and Lollapalooza, but instead followed to The Stone Roses and RIDE to a completely different musical valhalla? Ringo Deathstarr's new collection is thronged with songs that would have been hits in that but-for world. "So High," for example bounces with the energy of the greatest Primitives tunes. But while Ringo Deathstarr is known for hearing loss-inducing and chaotic live sets, the crystalline and balanced production on Colour Trip tempers somewhat the act's characteristic attack (which, of course, deliciously invites listening to Colour Trip at ear-bleeding levels -- recommended). There is still plenty of wonderful, wonderful guitar, however: the acid-rock lead at the tail end of "Chloe" leaps from the dense ocean of fuzz bass and guitar chords and recalls the best freak-outs of The Magic Hour. We've been writing about the Deathstarr since February 2007, but only in March did Sonic Unyon finally issue the act's first full-length record. Most bands we follow don't even stay together for four years; the fact that it took Ringo Deathstarr that long to craft an LP is a testament to something, although we haven't figured out what yet. Awesomeness? The power of positive thinking? Drugs? The band wasn't just sitting around doing nothing all that time, of course. An earlier EP was issued and reissued in various countries, and a series of singles also filled the gap. According to a Facebook posting or Tweet, which we also can't find (what is our problem? ), Ringo Deathstarr has been working on an "un-summery" summer EP. Completion of that new release will have to take a back seat to a whole lot of live dates, which the band has just recently begun announcing. Ringo Deathstarr play with local luminaries Young Adults at Great Scott, Boston on July 2.